Residents and business-folk in Greenwood are reeling from a devastating string of arsons in which the restaurant community has been particularly hard hit. On October 23, a fire set at the Green Bean Coffee House near 85th and Greenwood also destroyed the adjacent Szechuan Bistro, C.C. Teriyaki and Pho Tic Tac. 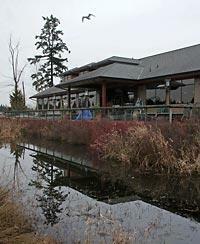 Three more fires set late Sunday and early Monday have the neighborhood unnerved. The latest arson extended to Greenwood’s popular Mediterranean bistro and take-out shop Olive You, which suffered $20,000 in smoke- and fire-related damage. 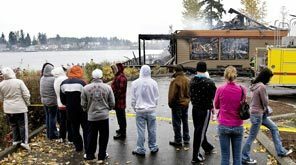 And on top of that came Monday’s news of the total destruction of Emory’s Lake House on Silver Lake in Everett after an early-morning fire. That news hit me on both a professional and personal level. The last time I talked to my friend Mark Wall, he was entertaining a house full of guests at a housewarming brunch a few weeks ago at his new home in Lynnwood. Today he — and approximately 50 other employees at Emory’s Lake House — are mourning the loss of their workplace, gutted by fire Monday morning. Mark had worked there for a dozen years. He was awakened at 5 a.m. Monday by a friend who’d heard about the fire on the news, and like many of his co-workers, made a beeline for Emory’s. “We all stood out in the rain and watched it burn. It was pretty sickening and we all cried a lot.” The cause of the fire remains under investigation. To them — and to the the owners and employees of the many businesses across our community that have suffered fire-related sorrows — I extend my condolences. While some Greenwood businesses will be up and running in new locations soon, the community continues to keep alert and will meet with police and fire officials tonight at 7 p.m. at an open meeting held at the Fellowship Hall at Phinney Ridge Lutheran Church.